Profound retreats English - Retreats in the South of Spain! Profound retreats are about going deep, being committed to yourself and what you are willing to 'see' of yourself. We are fully committed to 'see' you in this; to support, guide and inspire you. Retreats in the South of Spain are all about relaxing, visiting the beach, eating great food and of course; site- seeing! But also about; doing groupwork, individual work and meditating. 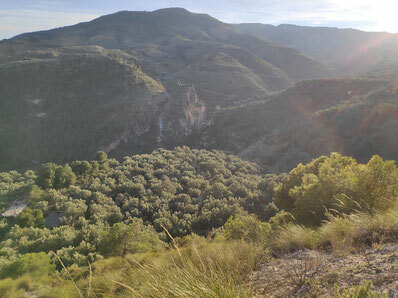 Our land is the perfect place for this (20 minutes drive from the coast and 20 minutes drive from Granada town) because of its beauty, its tranquility and its extensive views. 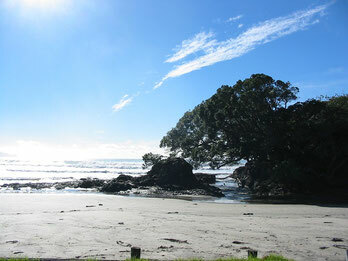 The goal of these retreats is to provide relaxation and a growing consciousness/more insight. After a retreat one should feel deeply peaceful and charged at the same time as well as have a much clearer view on the 'self' and an expanded consciousness. There are several staff members in the retreats. People with their own 'specialisations'. At the anouncement of a retreat the information about who will work there, will be added through this link. If they speak another language, English will be the main language used. More info on calendar, content and theme's of the retreats through this link. 'loving yourself retreat'. With this kind of retreat everything is focused on getting into a good relationship with yourself (and therefore with others) within 2 weeks. A 'relationship retreat', in which we work with couples to improve their relationship during a week. 'Detox retreat'. During this week long retreat all is focused on purifying the mind and body. A 'meditation retreat', in which you learn several meditation techniques in a weekend. A 'diving deep' retreat, where the focus is to change unwanted, painful programming. Rise at 8 am and -after a glas of freshly squeezed juice- start with a half hour yoga session or meditation together, to wake up. At 9 am a delicious breakfast will be ready. After breakfast it could be time for group work. 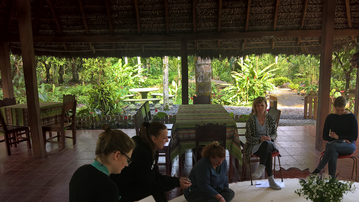 Examples of group work; a morning non-violent communication or a morning sharing together or a morning bodywork or....one of many possibilities, depending on the theme of the retreat and the specialty of the staff members. At 13 o'clock lunch is served and right after is a rest period. For some there will be some individual sessions, after the lunch. Others can fill their own time untill 3 pm. At the start of the weekend/week/2-weeks you receive a schedule on which you can find the times your individual sessions are planned (and also see the rest of the program). An individual session can consist of thetahealing, meditating together, bodyscan method, creative work, bodywork, working with horses, etc, depending on the staff member who provides the session. All kinds of methods can be used. Around 3 pm another group work session can be planned untill about 5 pm. Between 6pm and 7 pm is evening meal time with a mouthwatering dinner. In the evening, between 7 pm and 8 pm, some people will have individual sessions. Around 8 pm the 'working' day can be closed with a group meditation. After this it is 'free time' again. Some people will enjoy a glass of wine around a campfire, others will want to read a book by themselves, go for a walk or sleep early. In a 1 or 2 week retreat there is always one 'free' day per week included to look around the area, go to the beach, or do nothing at all. The last day of a 1 or 2 week retreat is kind of like a kick-down day. We have seen that it is quite hard to to step into 'normal life', after such an intense -but gratifying- time. During a kick-down day we pay attention to this. The weekend is fully packed, because a weekend is short and you still want to take away from it as much as you can. There is no time then for a kick-down day or for a 'free'day. Before a retreat starts you will have received an email with the following question; is there anything specific (an issue, a question, a circumstance in your life) you would like to work on, in yourself? The answer you give will be taken into account by all staff members to make sure you get the space to work on it and you get full support, so you can actually work through it. We guarantee a safe environment to share and be able to be open. It is possible that we make an adjustment to the program during the retreat, if it seems that that will increase the effectiveness of the retreat. The meals are always vegetarian, preferably even vegan (we noticed that people are able to remain a lot more 'awake' and clear in their head, then). It is possible to let us know beforehand if you have a certain diet you have to follow (glutenfree, lactose intolerence, etc), so we can adjust your meals to this. Certain retreats might have completely on antroposofy or raw food based meals as part of the theme of the retreat. With the retreat price is included; sleeping (beds, sheets, pillows, blankets), meals and in-between bites and refreshments (alcoholic beverages; 1 glass a day included) and all sessions and group sessions. With the accomodation there is choice between a 1 person tent, 2 person tent or more persons tent (as long as there is vacancy enough to choose). Information about retreats dates and themes.